A new conference facility was created through the introduction of a mezzanine floor over the whole footprint of a disused banking hall, doubling the floor area, and bringing considerable added value to a space with no prior practical use. The salient architectural features of the Grade I listed interior were recognised, retained, and highlighted during the creation of a 180-seat raked auditorium. State of the art facilities include interactive multi plasma screens and translation facilities at the upper mezzanine level. Access is by two new staircases: one a grand stair and the other for escape and ancillary services access. 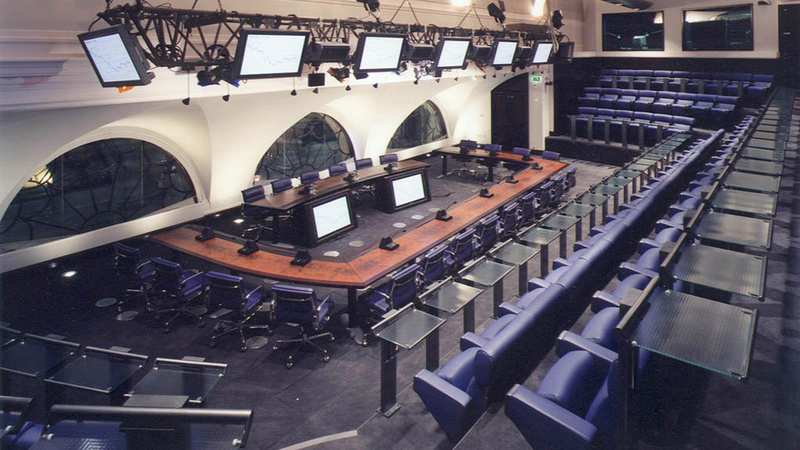 Full technical facilities within the auditorium cater for committee meetings, lectures, presentations, and press conferences. Support spaces include a reception area with cloakroom, toilet facilities for visitors, and a reconfigurable conference breakout area serviced by a fully fitted office and catering facility. Disabled delegates and members of staff are provided for with a new eight-person passenger lift. Auditorium seating spaces are allocated for wheelchair users as well as induction loops for the hard of hearing.